For free baby stuff, you'll no doubt get a lot of samples or baby freebies during your pregnancy. Everything from diapers to formula samples are slapped in your hands at the hospital, or doctor's office. As you snoop the web for discussion groups or other baby information, you'll find opportunities to sign up for additional free offers too. The Enfamil samples, straight from the company, your doctor, or their website, (Enfamil.com under "special offers" for $250 worth of samples and discounts), are good freebies. And while you'll also get other offers if you sign up for their Enfamil Family Beginnings Program, you won't have to buy anything for the samples and discount coupons. Even if planning to breastfeed, you may want to remember this recommendation. As determined as we were to breast feed, we later discovered a biological surprise as to why we simply could not. So these coupons proved great later on. BEWARE of most other free baby stuff offers. Anything which requires you to click down a rabbit hole of sign-ups and surveys to get the "freebie" isn't free. In particular, avoid those that claim you just "fill out surveys" to get free baby stuff. It's usually a scam. Watch for the words, "Complete the participation requirements. or the words, "Must complete the program requirements." These are very good indicators you'll have to buy something else, or sign up for something else that will quickly cost you big $. These are very common freebie shams, which require you sign up for some offer (vitamins, video delivery, home security, just about anything), that are "free" for a trial period. However, they require your credit card to launch, and automatically charge you later. They may also be very challenging to cancel. You may have to sign up for 3 or more offers at a time, just to get the original freebie! And each one may have cost you $19.99, or free with $25/month thereafter. They're not worth the original free baby stuff, certainly. They will also make you "sign-up" for one product on one page, then another, then another, they'll already have you signed up for one or two, and STILL you won't know how many more links are required before you actually get to the page with the "free" thing. Even some coupon sites can be convoluted and scamish, but we discovered one that really works. For real, easy coupon discounts we've found: couponsurfer.com to be one of the more legitimate sites. This website offers regular coupons for printing and use at normal retailers. They include baby and maternity items, diapers, baby care stuff, groceries, food, restaurants. There are lots of "real" coupons available. You have to sign up, but they do not ask for your phone (for telemarketers) nor for your home address. (No junk mail.) And you can print and click as soon as you've signed up. No rabbit holes. You can even see the coupons BEFORE you register to know what you're getting. However, still be wary of offers that link you to other coupon sites. You'll again see more "sign-ups" and freebies that are really aren't. Stick to the in-store coupons for best savings, ease and legitimacy. There's even a $27 all family and games coupon for Chuck-E-Cheese, or diaper discounts, and baby food offers. Mom's Free Printables. These are printable invites, records, cards, decorations, crafts, or almost any paper product that moms on a budget might find easier than a trip to the stationery store! Legitimately, free. Enjoy. 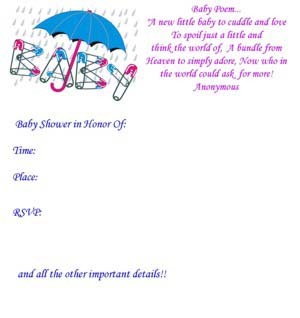 Choose from baby shower invites and games, to birthday invites, children's crafts or decorations. And the simple files are something you can print out over and over at no charge. You may have fantasies of creating every craft item you want from scratch, but in a pinch, these could prove handy. We're working on a download a free shopping guide for baby bouncer seats and swings. It's a complete table with all the measurements for various versions. If you must shop in-store, you'll be able use it to compare the lengths and sizes of the products you're interested in. Each of these is about as legitimate a baby freebie, as you'll find!